Gen Z has gotten a bad rap. Yes – their faces may be glued to their smartphones, but don’t mistake that for a disinterest in what’s happening in the world around them. This generation is a force to be reckoned with – using their digital devices to spread social and environmental messages far and wide. But they’re not going it alone – they expect companies to be their partners in change. Companies: it’s time to enlist Gen Z to share your CSR message. 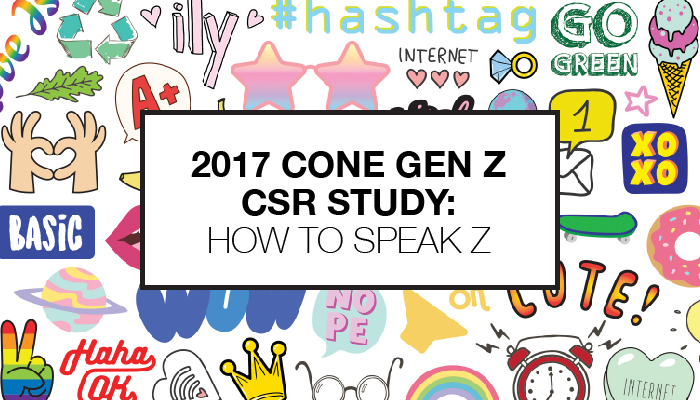 We are pleased to share our newest research, the 2017 Cone Gen Z CSR Study: How to Speak Z, which launched this week. This first of its kind study examines not only Gen Z’s attitudes and perceptions around CSR, but also how they’re willing to get involved for positive change. This young consumer group already includes 60 million teens with $44B in spending power- and by 2020, Gen Z will account for 40% of all consumers. Now is the time for companies to gain insights on these digital natives to better understand how to engage with a generation that wants to make an impact on social and environmental issue, whether it’s online or in real life. We invite you to download the research here or consider joining our webinar presentation on Wednesday, October 4, at 1 p.m. ET to learn more about the study. Registration can be accessed here.